The Capezio® Stitch Kit comes in ballet pink. This kit includes 75 yard of bonded nylon thread, and 2 large-eye needles. 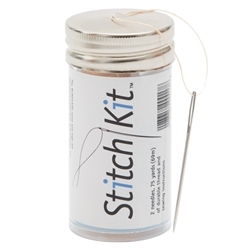 The Capezio® Stitch Kit is great to have on hand to repair ballet slippers or point shoes. In addition to the strong thread and needles, the kit also includes sewing instructions for first time sewers.